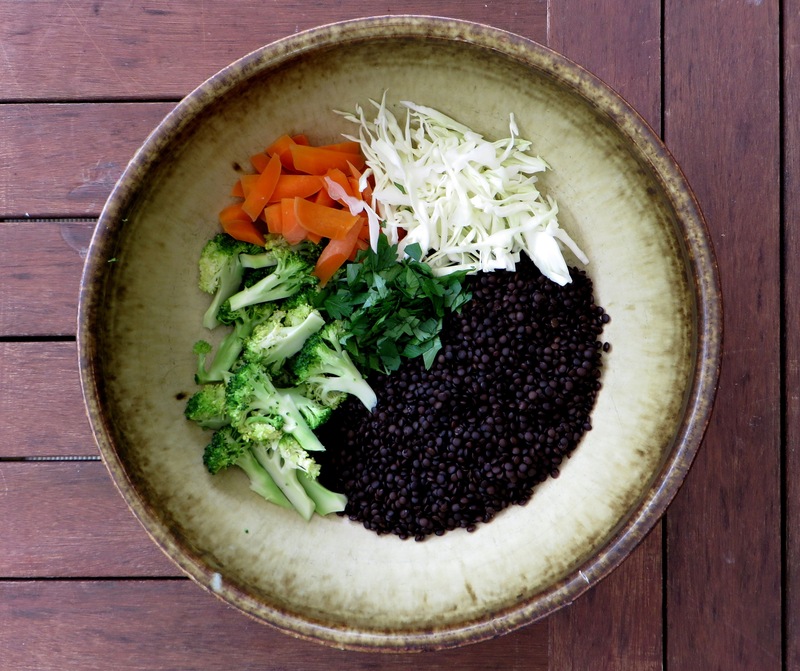 Beluga Lentils and Miso Maple Dressing – One Hungry Thespian. Being my first proper post on this blog, I feel as though I need to make some introductions. You are, after all, about to read about the food I make so it seems only fit that you have a little prior knowledge about the hands that prepares it. This, however, is what I’m not going to do. You like reading about food and I like making it: why beat around the bush? Let’s EAT. I started off in the kitchen yesterday planning to make a sweet, fruity lentil salad with fresh rhubarb. I was all set to go. I’d even bought black beluga lentils specially for it because I wanted them to hold their shape against the firmness of the fruit. Unfortunately, the moment I tasted the rhubarb I knew it was time for plan B (let’s just say that after pulling a myriad of strange faces, similar to those you’d pull after eating a whole lemon, it was clear that the sweet fruit in my fruity lentil salad wasn’t at all that sweet). How could you resist these beauties, huh? After sitting cross-legged in contemplation on the kitchen floor for a short while I summoned the courage to take a look in the fridge. I needed courage not because I didn’t know what to do next, but rather because I knew I’d come across that bunch of kale from the markets last week that has wilted and would make me feel guilty about not using it. I opened the door, came across the kale, resolved to cook it tomorrow (this kind of behaviour is highly likely the reason it has remained unused since last saturday…) and lifted my gaze to the contents at eye level. 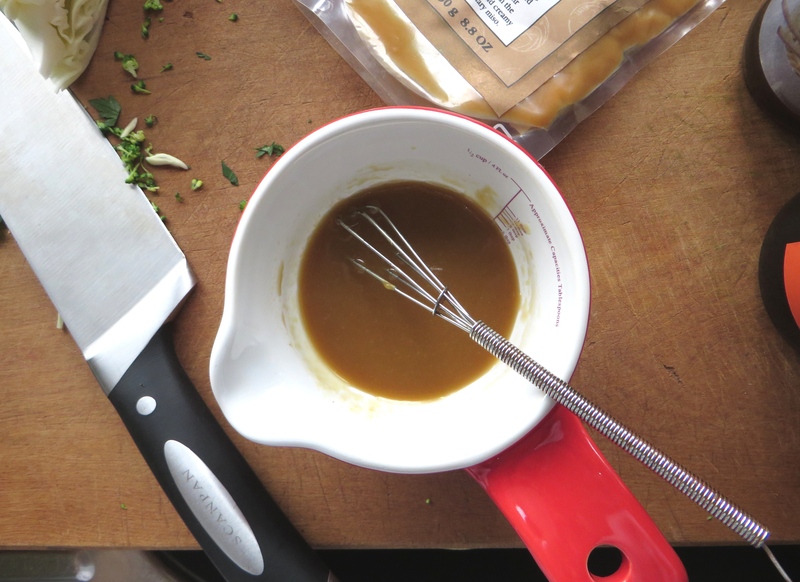 I saw the miso, the miso saw me, I grabbed it and that was all I needed to start plan B. I wish I could say I was overcome by some divine inspiration to pick it, but really it was because I love white miso and I jump at the chance to cook with it. Five minutes later, I’d mixed white miso paste with soy sauce, maple syrup and the most divine smoked sesame oil and I was ready for action. You can hear it just screaming for a salad to smother. Bamboo steamer, check. Broccoli and carrots, check. Pot of boiling water, check. By the time I’d washed up a little and picked a good bunch of parsley my vegetables were done in the sauna. Tender but not soft, check. I cut the broccoli into little florets, not going too small because I still wanted to actually see the little trees on my place, and sliced the carrots. It all went into a bowl with the lentils and I stood back, impressed with the visual display I’d made in the bowl, to take a photo. I also quickly learned why all the food photography blogs I follow told me to never use my camera’s flash. Tentatively, I reached across to the bowl of dressing knowing full well that the moment had come, and, in an excited flurry, I splashed that sweet and decadent savoury liquid over my vegetables-in-waiting. This is what food is about, I thought, as the rich unami smell of the white miso struck me and made my mouth water. More than it already was watering, that is. Not leaving a moment to spare, I dove my hands right into the bowl flipping everything around in a maple syrup fueled frenzy (I may or may not have slurped an entire tablespoon of the stuff mid-photo. Go on, arrest me). 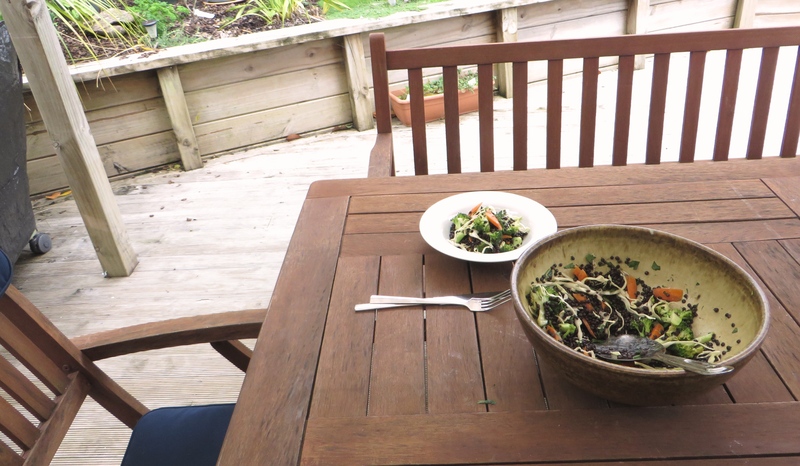 Grabbing the bowl, I raced outside onto the table to take a photo before the rain set in, only to realise that I hadn’t eaten at all since breakfast and I’d been working on this salad for far too long. Need I say what happened next? This happened, then I ate. Story over. Rinse the lentils, drain and place in a small saucepan with the water. Bring to a boil, turn down the heat and simmer for 15 to 20 minutes or until tender. Drain and set aside. Bring 2cm of water to a boil in a medium saucepan, place a bamboo steamer basket (or whatever steamer you have on hand) over the top and arrange the broccoli and carrots in a single layer. Cover with the lid, and leave to steam for 4ish minutes. Meanwhile whisk all of the dressing ingredients together in a small bowl, except for the water, and add a tablespoon of the water to thin it out a little. You may need more water, you just need it to be thin enough to cover all of the lentils and veges, but bear in mind that warm foods will absorb more liquid so don’t be afraid to thin it even more. By now, the steaming should be about done so turn off the heat. Chop your broccoli into smaller florets, keeping those beautiful little trees intact, and slice your carrots. 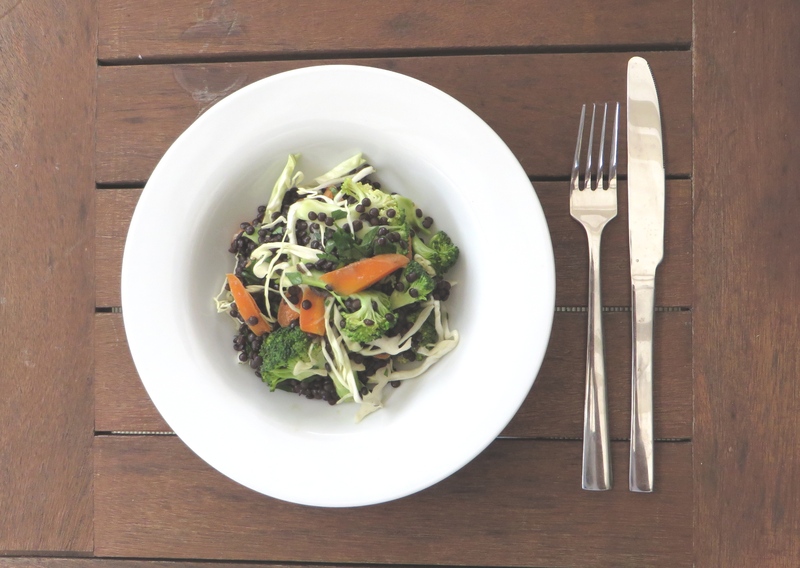 Place the lentils, steamed veges, cabbage and parsley in a bowl and pour over your dressing. Mix well, and serve immediately. // SERVES 2 AS A MAIN LUNCH OR 4 AS A SIDE DISH. Keeps well chilled for 2-3 days, but it might need a touch more dressing by the third day (even more of a reason to make up a larger quantity and keep it in a jar in the fridge!). Enjoy. Stop taking photos, Luke. IT’S LUNCH TIME.